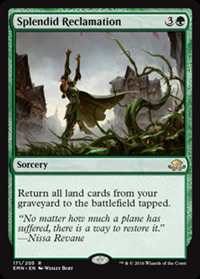 7/13/2016 If an effect states that a land enters the battlefield tapped unless a condition is met, Splendid Reclamation’s effect puts that land onto the battlefield tapped even if that condition is true. For example, you may reveal a Plains as Port Town (from the Shadows over Innistrad set) is returned to the battlefield, but Port Town will still enter tapped. O.O meet my friend tireless tracker. And all those landfall triggers from BFZ oh my. This card can work with so many strategies. Oh my. You. I like you. Gitrog monster. Land animator decks. Borborygmos Enraged EDH. Sidisi self-mill. The list goes on. Game-breaking? Maybe not. But a powerful card in many decks. Simple. Dredge yourself/Mill yourself, then cast the spell. Return a bunch of Mountains and Valakut. gg. Is it worth the 2 over Planar Birth? Maybe, but you have to be packing a lot of utility lands. not necessarily "utility lands" (assuming you mean lands with spell-like effects) but rather it allows synergy with mana fixing lands, most importantly fetches which helps a lot, since they naturally end up in the graveyard on their own. playing only (or at least a very high number) of basic lands is a very big cost for planar rebirth which requires a deck that ALREADY has some deck building costs to pays (ways of getting lands into the graveyard). This belongs as a singleton in my Scapeshift deck I think. Scapeshift followed up by Stunning Growth? Yes please. I don't think it's as broken as it looks. This is a ramp spell. It does nothing on its own except give you more lands. Ramp decks already have consistency issues inherent to their design, needing to draw defense, lands, ramp, and finishers. It's going to be a real deckbuilding challenge to add 'graveyard shenanigans' to the list of requirements.